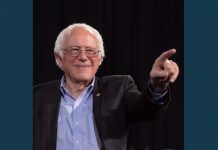 March 24 (UPI) — Sen. Bernie Sanders called on Americans to “stand up to hatred of all kinds” during a visit to a Los Angeles Islamic center a week after a shooting at two New Zealand mosques left 50 people dead. The Democratic presidential candidate from Vermont spoke at the Islamic Center of Southern California on Saturday before holding a rally for thousands of supporters in the city’s Grand Park. “In this difficult moment, not only in American history where we see a rise in hate crimes, and not only in a world where we see a growing tendency toward authoritarianism, where demagogues are picking on minority communities all over this world, now is the time … for us to stand up to hatred of all kinds,” Sanders told about 200 people gathered at the Islamic center. “At a moment in history where we are seeing a huge explosion in technology, and huge increases in worker productivity, we will no longer accept a situation in which the younger generation will have a lower standard of living than their parents,” Sanders said.